Sitting at the crossroads of the city’s financial, entertainment and waterfront districts, The Ritz-Carlton, Toronto is in the middle of all of the action. In less than five minutes, you can walk to the Roy Thompson Hall, the Toronto International Film Festival Bell Lightbox, Second City Toronto, CN Tower, Metro Toronto Convention Centre and restaurants and shops along King and John streets. Decked out in modern yet classically elegant décor, the sleek and chic lobby immediately makes you feel at home. Take time to look around — more than 450 pieces of Canadian artwork decorate the hotel. All 267 guest rooms and suites offer fantastic views from the floor-to-ceiling windows. This urban Forbes Travel Guide Five-Star hotel has some of the largest rooms in the city. 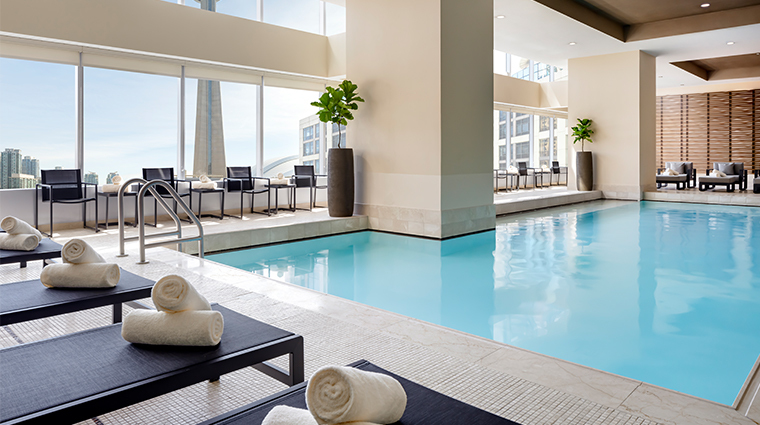 Elsewhere in the hotel, you’ll discover TOCA, one of Toronto’s best Italian restaurants; Spa My Blend by Clarins, a calming respite; and Ritz Bar, a light-filled lounge with live jazz, craft cocktails and Peruvian bites. The top-notch Spa My Blend by Clarins specializes in skin care. Get a winning facial for a personalized experience that includes a thorough skin analysis. Indulge in handcrafted Italian cuisine at TOCA and don’t miss ordering some selections from the cheese cave, the only one in Canada. Sit in DEQ Terrace & Lounge’s cozy outdoor patio, where you can take in vistas of the CN Tower next to the fire pit with a Margarita Via DEQ (Cazadores Anejo, Grand Marnier, lime juice, honey syrup and roasted honey-glazed lime). The hotel puts you in the midst of the city’s entertainment and financial districts, making it a convenient base for leisure and business travelers. Boasting one some of the largest rooms in Toronto, the hotel offers comfortable, elegant accommodations. The Ritz-Carlton, Toronto is directly connected to the PATH, a 19-mile underground walkway connecting downtown shops, attractions and the St. Andrew subway station. It’s a great way to get around during the freezing winters and humid summers. The hotel fills up during the Toronto Film Festival, so if you plan on attending the event or visiting during September, book early. All rooms have floor-to-ceiling windows with views of Lake Ontario, the CN Tower or downtown along with heated perimeter floors, Bose Wave music systems with smartphone docks, and LCD flat-panel HD televisions with DVD players. A neutral color scheme with lots of tan and African Anigre wood millwork decorate the accommodations. Floors 17 to 20 at the Toronto hotel are “Club Level,” offering a special lounge with all-day food, drinks, computer and printer access, newspapers, magazines, a dedicated concierge and other perks. 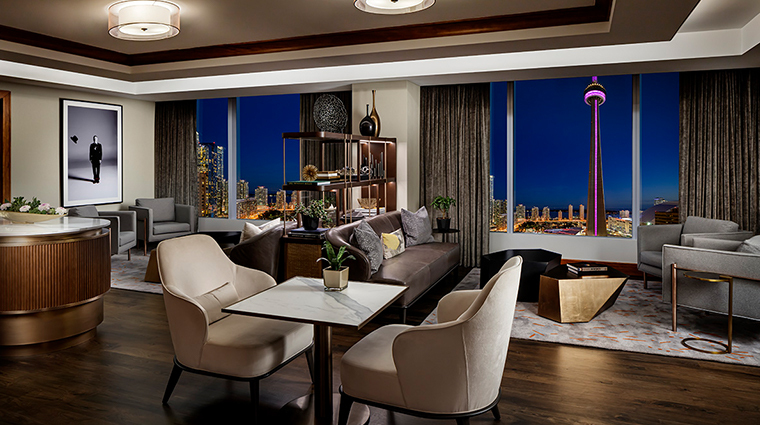 The only rooms with balconies at The Ritz-Carlton, Toronto are on the sixth floor. Covered with cream Portuguese Estremoz marble, the bathrooms have separate rain shower stalls and tubs, in-mirror TVs, heated floors and Asprey Purple Water bath products. TOCA’s exquisite cheese cave carries more than 35 different selections from Canada and all over the world. Sign up for one of the monthly pairing events to taste some cheese with beer or wine and to tour the cave. On Friday nights, the Four-Star restaurant offers a four-course tasting menu of its made-from-scratch pastas. Among the pastas, try the housemade ravioli capresi stuffed with caciotta cheese. There’s also plenty of secondi dishes, from branzino to filet mignon with foie gras. The warm wood-paneled dining room with curved gray booths is beautiful, but upgrade to the chef’s table for a special experience. The table sits right off of the kitchen so that you can watch the chefs at work.